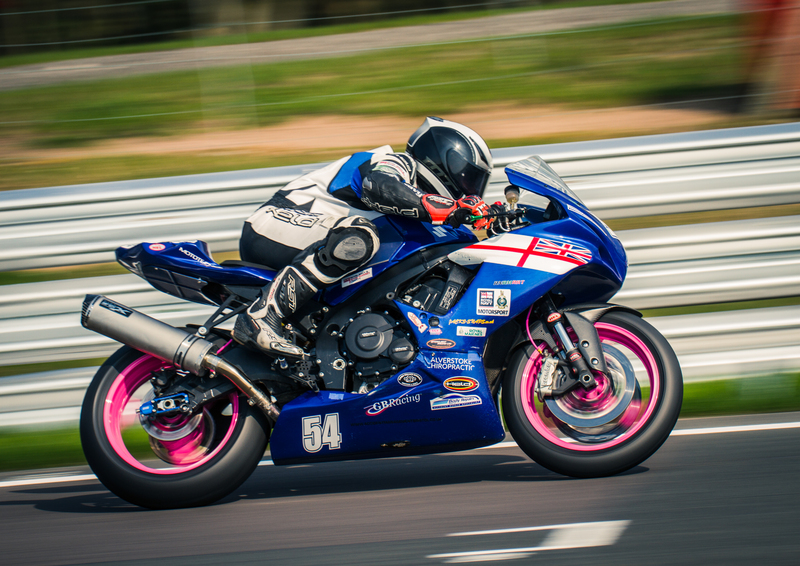 With the RN and RM Championships starting at Oulton Park this year, it brought a mix of experience to the track. A few riders having never been on this track and the more experienced ones wanting to better their previous times and positions it was game on from the start. The weather report showed the temperature was to be in the early 20’s with beautiful sunshine and good track temperature. For once it delivered and all the riders were itching to go. With the guys that had not been to the track before it felt like a baptism by fire as the more experienced riders were posting fast lap times early on. 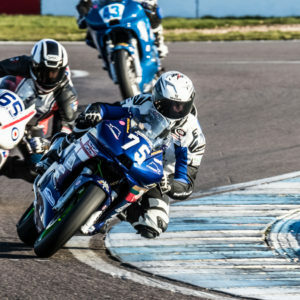 Sgt Luke Terry went from learning the track to picking up the pace quickly and grew in confidence. LA (AH) Alan “Sponge bob” Curtis who had also never been to the track started slowly but was soon up to speed quickly, so quickly in fact that he came up to clay hill flat out in 5thonly to over shoot the corner and hit the crash barrier head on at druids corner. Fortunately the damage to bike and rider was minimal and was cleared to carry on with just his pride bruised. With over forty riders lined up on the grid, the cb 500 competition is always fierce. Lights out and away our three team riders Cpl Dave White, Luke and Cpl Charlie White go for the first race of the day. Charlie’s poor start left him last into the first corner, however he managed to claw his way back through the pack and finishing in 30thplace. Luke and Dave started well, with Luke able to make up places quickly. Both were neck and neck into the first corner until David managed to slip past Luke at Shell oils. Luke mounted a strong comeback battle but just finished behind Dave. 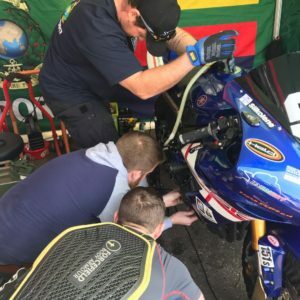 Race two and Charlie had another difficult start and quickly found himself sandwiched between two riders into the first chicane but managed to fend them off and continued his momentum gaining four places in two laps and finishing 27th. David and Luke again both had good starts and continued to battle between them gaining places respectively. With just the one rider in this class, Alan “Sponge bob” had his work cut out. After qualifying 23rd, his main focus was his race starts. The lights went out and he got away to a good start but had to act quickly to avoid hitting a rider that stalled on the grid in front of him. After finding his confidence again, he managed to knock four seconds off of his lap time and finish in 14thplace. Race two and Alan found himself fighting for position whilst trying to pick his way through new comers and back markers, more than once the hand of ‘sorry’ was raised for diving underneath new comers and coming more than a little close at times. Overall Al finished 13thon the grid. Cpl Dan Greenwood, CSgt Brian “The Luge” Fuidge and Mne Callum Scott. Scotty set himself the goal of improving his lap times from last year, however with his lap timer not working and some of the larger than life fast riders leaving him behind he thought nothing had changed. Qualifying went better than expected for Scotty with a new PB and 23rdon the grid. Dan and Bri also placed well, setting the scene for a good battle. The riders set off under the green flag for warm up but two other riders went down and left a huge oil spill on the track. After the restart Scotty spent three laps chasing down some of the fast guys the race was red flagged due a serious accident. The race was then abandoned to be replayed at a later date. 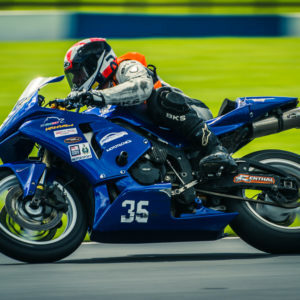 Race two got underway and all three riders were battling it out, Scotty got himself into a good battle with some of the faster riders and managed a 1:50 lap, 19 seconds quicker than last year. Dan was going well and keeping his focus for the signatures he needs to lose his new comer bib. Bri bringing out the big guns on his Fireblade was keen to get stuck in. After changing his gearing the Blade felt much more settled and he was able to concentrate on being smooth and getting every thing to flow, which changing from a 600 to a 1000 is harder than it sounds. With this being the pre TT round there were a number of top riders making life very fast. Bri Managed to get to a 1:49 which was a PB. With the riders having more notable success on track, confidence was booming and the team work as ever was on point. With only the one crash from the team, spirits were high and with the great weather all riders broke their lap times and PB’s. The event could not have taken place without the hard work and dedication from the event organisers, marshals, paramedics and doctors onsite. The event was over shadowed however by the death of Dwight Bond in race one of the Pre national 600 race who succumbed to his injuries, the teams deepest sympathies are with his family in this difficult time.